Stephen Colbert's Late Show has bested Jimmy Fallon in the ratings for the first time since its debut. Stephen Colbert, now the man to beat. Stephen Colbert’s Late Show is now the most popular show in late night, besting The Tonight Show With Jimmy Fallon in total live plus same-day viewers for two weeks running. According to Nielsen ratings data, the CBS late-night staple averaged a little more than 3 million viewers per night last week, 134,000 greater than Fallon’s average and the largest margin of victory for Colbert’s Late Show since it premiered in September 2015. It’s been a long road to success for Colbert since taking over for David Letterman. The initial buzz around his transition to a broadcast network died down quickly, and Late Show’s ratings dropped with it. Indeed, three months into Colbert’s tenure, The Late Show was in a virtual tie for second in the ratings with ABC’s Jimmy Kimmel Live!, with NBC’s Tonight Show consistently running the table. 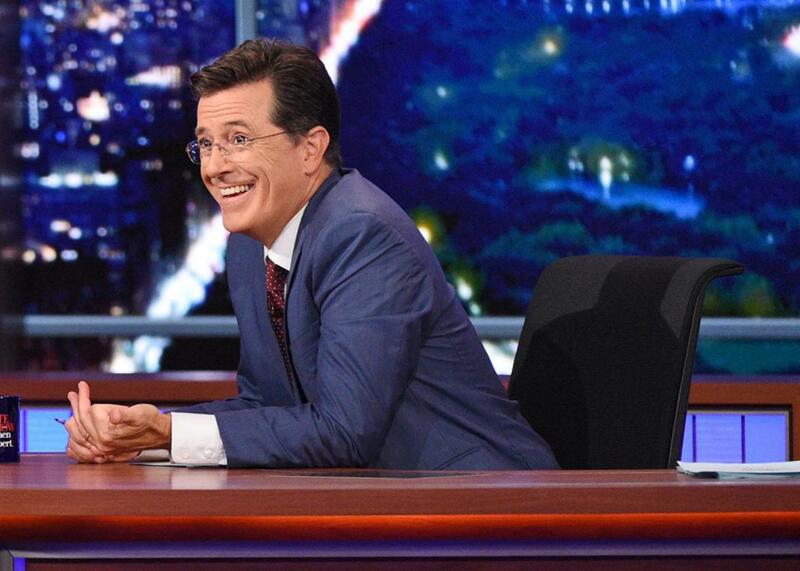 Over its first 12 months, Colbert’s show averaged nearly a million viewers less than Fallon’s. The beginning of the new Late Show was marked by an awkward balance. Colbert’s muted comedic approach resonated with neither his left-leaning fanbase nor the relatively apolitical CBS viewers he was vying to reach. But the show improved over time, with Colbert emphasizing his political savvy and bringing a uniquely intelligent sensibility to the rote late-night routines of celebrity interviews and throwaway bits. In a firm signal of the change in direction, The Late Show brought in new leadership in April 2016, naming CBS This Morning’s Chris Licht as showrunner, and it’s been on an upward ratings trend roughly since then. Colbert’s increasing strength in the late-night space speaks, undeniably, to his critical focus on President Trump. But where other comics like Seth Meyers have built esteem through forceful daily denunciations of the new administration—and where Fallon’s stridently apolitical approach suddenly feels insufficient (and disingenuous) already—Colbert offers a different brand of resistance: relief. His daily tackling of Trump’s endlessly scandalous presidency remains sharp, to be sure, but it can also be cleverly light-hearted in execution. He doesn’t convey anger so much as he does bemusement—and in turn, he offers a distinctly comforting experience for viewers of his political ilk already overwhelmed by the news of the day. Given the anticipation surrounding Colbert’s launch a year and a half ago, The Late Show’s initial ratings drop made clear that audiences weren’t connecting with him. That’s why the news of Colbert’s nosing ahead is so significant. Viewers aren’t merely ready for more aggressively political content. They’re looking, quite specifically, for a smart, calming, and nuanced voice like Colbert’s.